As the car passes by, it almost grazes two thick, meter-high blocks of cement. One little miscalculation and the paint would be scraped right off the car. “The caveirão doesn’t go here,” someone says, referring to the armored cars specially built for the Military Police to enter favelas. “Nor do the patrol cars,” says a third, jubilantly. For the forces of repression, entrance to La Comunidad Chico Mendes on the Morro de Chapadão, in the northern zone of Rio de Janeiro, is restricted. The door opens onto a wide, covered courtyard with offices and meeting rooms in the back and a second floor with more rooms. An enormous poster warns against the consumption of alcohol; in another corner an even larger poster outlines the ten “columns of the movement” – economy, free exercise of religion, family, health, housing, education, sports, art, leisure, and infrastructure. They are called columns because they are the pillars on which the organization is based, according to the needs of the popular sectors. A short, stocky man of about sixty offers us fresh water to relieve the tremendous carioca heat and invites us to walk around the facility. It all happens calmly, as if in slow motion, perhaps as a way to counteract the heat. Gelson invites us to sit down as the woman from the store appears. Janduir tells us that they were the first MCP activists to arrive at the favela more than 20 years ago, when there were ramshackle houses made of wood. The main difference between la Comunidad Chico Mendes and other favelas is that it was formed by a takeover or invasion, not by the gradual accumulation of families. People here were already organized before they occupied the hillside. They arrived together and began to build the neighborhood, along with houses. They were leftist activists who decided to name the settlement for the most emblematic rubber tapper of the era, assassinated by landowners in 1988. They recall that the first group of activists, who created the community, no longer lives there. Some were assassinated by traffickers; others disappeared. They believe they were kidnapped by traffickers. That generation had it hard; traffickers did everything to prevent them from establishing the settlement. Now they work differently – less ideologically – avoiding confrontation with more powerful enemies like the police and the traffickers. Above all, they work by building ties to the people. The first steps taken in Chico Mendes involved organizing men’s and women’s soccer championships. It was the way to gain the neighbors’ approval, earn their confidence, and secure a place in the community. Gelson is a soccer enthusiast who enjoys playing as much as he can. Almost 20 years ago they created a school support group to encourage learning. The group serves 70 boys and girls between the ages of two and 14 in two shifts with four teachers and two assistants. Six years ago they created a pre-school for mothers in the community. It now accommodates 20 students in two shifts, with three caregivers. The two educational groups are supported by parents who supply money and organize fundraising activities. Once a month they hold an assembly to discuss progress at the schools and try to resolve problems collectively. The garden and the central meeting room in the movement headquarters building are used. The most important “column” or pillar of the organization is economy. Seven people are involved in the Collective Purchases Group, which recently opened the produce storeroom that supplies some 150 members of the community. With a loan from the Collective Investment Group (GIC), a construction materials barracks is staffed by two members of the movement. Ten families are organized around the Collective Purchases Group, which allows them to buy in bulk, at lower than market prices. Later a Collective Production Group was formed, in which five families produce soap, detergent, disinfectant, and softeners from recycled vegetable oil. The group began as part of an environmental campaign and now sells products to a Rio de Janeiro government cooperative. The most important group in the area of economics is the GIC, with 400 “investors” who each earn 2 percent interest. Volunteers administer the group and grant loans to people from the neighborhood. 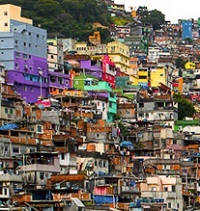 Gelson maintains that more than 30 homes in the barrio were purchased with money from the GIC, which also made it possible for those who earn their living transporting people from the metro to the favela to purchase trucks. “The GIC solves many problems for people in addition to providing an incentive to save. 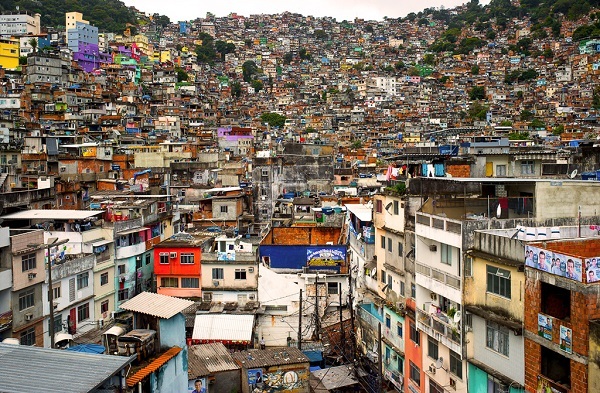 People in the favelas usually don’t save. This way they realize the importance of saving.” [ii] Very often a family uses up their gas and can’t afford to buy more because there is no money. Now they can go the GIC and resolve the problem without having to go to the bank. What is today the MCP began 40 years ago with a group of people, like Gelson, who formed the Juventud Agraria Católica (Catholic Agrarian Youth). During the military dictatorship they held a conference in which they decided to “build a movement that not only worked for reforms and improvements, but also protested against capitalism.” [iii] And they created the Rural Evangelization Movement (MER), which, in fact, later became independent of the church. Gelson well remembers the poverty of the countryside. His mother had 12 children–six boys and six girls–in a village in Paraíba. “She would buy a container of milk for everyone. And since it didn’t provide for us all, she would add a lot of water to it.” He worked the fields, and one night, when he was 11, he opened the gates and let out the cows and bulls. It was his first act of rebellion. “It was the hardest time,” Gelson says. “The militants were middle-class; they had their families and couldn’t stand going to the favela. They decided to follow the parties, like the PT, and the big unions.”[v] It was the decisive moment in which they lost more than a third of their members. Those who remained decided not to join political parties because they felt that it would divide the popular sectors by separating the leaders from the base. Work on the outskirts of the cities transformed the movement and the people who were part of it. They began to work around the 10 columns and developed a way of creating low-income communities. Today there are more than 20 communities, half in urban areas. In 2006 they began publishing the newspaper Voz das Comunidades to make the movement more cohesive, since it is now present in 12 states. In 2011 they decided on the current name, MCP. In the long run, this means “conquering a popular government from below to build a communitarian society based on indigenous and quilombo welfare, in egalitarian campesino communities like Canudos[vi], based on popular, worker socialism.”[vii] For them, governing from the bottom up is “to control community services from the base through participative democracy,” creating conditions for people to participate. Janduir and Gelson explain that the movement takes its inspiration from historic struggles, especially those of the indigenous Guarani, the quilombos, and 20th century labor struggles. Their political principals are centered on political autonomy and independence from party politics, but also involve economic ventures, which is the way to build people power. The Chico Mendes GIC controls 700,000 reals (about 170,000 dollars) administered in meetings of 60 to 70 people. In just 12 years they have become a source of financing for families in the barrio–without indebtedness. Each person who takes out a loan has another as guarantor. No debt and community control. Janduir shows us a notebook where everything is written by hand. “I like doing it this way rather than using a computer,” she says smiling. Combined, the communities have 30 GICs administered by more than 100 people for the benefit of thousands. The MCP has 100 production, purchasing, and service collectives with more than 1,500 members. They produce clothing, bags, and cleaning supplies; they raise animals and cultivate crops. Those in the purchasing group organize collective markets and sell gas and grain. The service groups run laundries, collect garbage, construct public works, and purchase trucks for the community. They have created ten schools, and organized health groups that have led campaigns against alcohol consumption and given courses on dental and reproductive health; they began with a community therapy team. “It always has to do with community needs,” maintain Gelson and Jundair. “Imagine that one day people will create millions of groups like this in Brazil,” says Gelson. “It’s very different from recruiting people for a revolution and taking power. Then what do we do? ” It is a different path to change, similar to Zapatismo, although the MCP does not refer to the EZLN. “In this process we are learning to govern a GIC, a small business, and from there we learn to govern a school, a municipality, collectively, in solidarity, with transparency and without corruption,” Gelson continues. All the work that is carried out, from sports to schools and investment groups–everything that has to do with building community–is designed to build popular power, provided two requirements are met: these initiatives are outside the market and the State (they receive nothing from any government), and they are collectively managed by members of the movement. All of this is what they refer to as people power. “The popular economy is the economy that’s already there; it’s the people’s economy, like the street vendors and local outdoor markets. But what we need is an organized popular economy with a conscious collective management,” says Gelson [viii]. They’re not inventing something from scratch; they take what is already there and systematize it through training and collective organization. Self-management can be understood as the systematization that the popular sectors create spontaneously. At the Annual Assembly in August 2014, members of the MCP concluded that they were not as self-sufficient as they wanted to be. 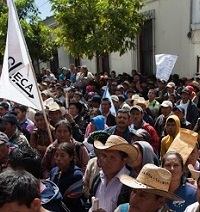 “We continue to perform more community activities (economic, cultural activities, and collective actions) than protests for public policy and in defense of rights.”[ix] This imbalance, according the MCP, is due to the fact that for 10 years they were focused on the construction of communities and during that time leaders of the movements were co-opted by the government. This debate is part of all new movements in Latin America: how much energy should be spent building something unique and how much should go to dealing with state institutions. There are two sides to the debate on public policies (participation in the management of public institutions at the local level): fear of being co-opted by the State and fear of isolation. It is the need to choose between creating popular community or governing without power. “There is a permanent contradiction,” conclude the members of the MCP. That’s why when Gelson is asked about the difficulties faced by the movement, he says they are internal not external. “The most difficult part is educating young people,” he says without hesitation. When he was a young man in the 1960s at the height of the military dictatorship that was the reality that created consciousness and showed the path to follow. Today things are more complex: consumerism and social networks are sources of confusion. The slow, everyday work of the movement may seem like it amounts to little, nevertheless, they know that there is no other way. [i] “O futuro e se organizer,” interview with Gelson Alexandrino, revista Território Autónomo, Rede Reclus-Kropotkin de Estudos Libertarios, Rio de Janeiro, N° 2, otoño de 2013. [iii] Mariana Affonso Penna, “A procura da comunidade perdida: Historia de memorias do Movimento das Comunidades Populares (1969-2011), Universidad Fedeeral Fluminense, 2012. [iv] Jornal Voz das Comunidades, marzo de 2006, p. 1. [v] “O futuro e se organizar,” ob. cit. [vi] Popular movement in the northeast that followed Antonio Conselheiro in Canudos (northern Bahia), which was defeated by military intervention. The movement inspired films and novels such as Rebellion in the Badlands by Euclides da Cunha and The War of the End of the World by Mario Vargas Llosa. [vii] “2° Encuentro Nacional del MCP,” 15 a 17 de marzo de 2012, Feira de Santana, Bahia. [viii] “O futuro e se organizar,” ob. cit. [ix] Jornal Voz das Comunidades, N° 24, marzo 2015, p. 3.